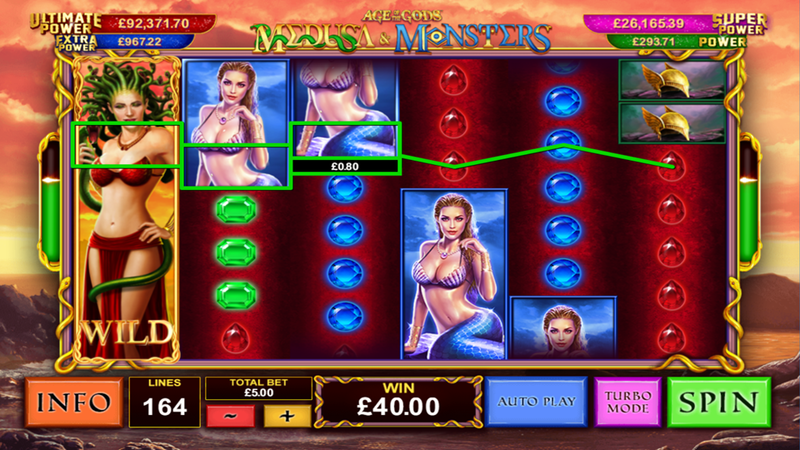 The latest addition to the Playtech award-winning Age of Gods series of progressive jackpot video slots, Age of the Gods Medusa and Monsters is a Greek mythology-themed game that utilizes 6-7-6-7-6-7-reel mechanics and promises 164 ways to score. Prospective winners will benefit from Wilds, Stacked Wilds, Medusa’s Gaze Free Games and Medusa Wild Shifts with Re-Spins eventually leading to 4 progressive jackpots. Interested to learn how to win the major prize? Read the Age of the Gods Medusa and Monsters slot review and try to implement all tips received. We have no free play mode available yet, but take a look at the Age of the Gods Medusa and Monsters screenshots instead. Or why not simply giving a try with one of the recommended casino sites above? Like all other titles from this same provider, this is a title you can also play for fun or for the real money. None of the less, the main task always remains the same – to combine 3+ matching symbols and receive a number of coins according to the paytable. The coins range from €0.25 to €25, so each player can set up his own betting strategy and wager between €0.25 and €500 per round. You can use Medusa Wilds to replace any other symbol and thus form a winning combination, presuming we don’t talk about Scatters. Themed icons such as Minotaur, Cerberus or Aphrodite have much higher rating than other and pay a maximum of 150 coins for a combination of 5 of a kind. Once a Wild appears in the base game, it will turn into Expanding Wild and cover the entire reel. Tips to receive a 3000-coin big win: get 7+ Wilds as a cluster. The Age of the Gods Medusa and Monsters Bonus prize may be triggered randomly and you will be taken to another 5x4 screen filled with coins. Pick 3 to reveal the amount of your jackpot prize. The Age of the Gods Medusa and Monsters Free Spins round starts when 2+ Scatters appear on the reels 2, 4 and 6. You will receive 6 Medusa’s Gaze Free Games and get to pick a shield in order to reveal the highest-paying symbol that will turn into Sticky Wild and remain position for as long as you keep winning. As the game is completely built in the HTML5 technology, you can play online on iPhone, Android smartphones and tablets without a need to download a special app. All options, including the free play mode, are enabled by default. 3. What is the RTP factor of Age of the Gods Medusa and Monsters? Official RTP info is still to be gathered on the Playtech-powered sites, but we think it will be somewhere around 96.09%. The Age of the Gods Medusa and Monsters recension clearly showed we have a highly-volatile yet rewarding game that combined the best of its ancestors with modern winning features. You can always try the demo to see would the world of gods and mythical creatures be the right experience.